Encompassing more than 30 years of design excellence in the test and measurement and control industry, Dataforth Corporation’s MAQ20 Industrial Data Acquisition & Control System continues to grow as new modules and capabilities are added. The latest analog input modules to be added to the system are the strain gage and frequency modules. The MAQ20-BRDG1 strain gage module offers 4 input channels and can interface to full, half, and quarter bridge sensors using 4-wire or 6-wire connections. All channels are individually configurable for range, alarm limits, and averaging; in addition, sampling rate, resolution, bandwidth, excitation voltage, and choice of shunt calibration resistors are user settable parameters. The MAQ20 frequency input module accepts zero-crossing and TTL signals with frequencies from 1Hz to 1MHz plus State Change and provides a DC stimulus for contact sensors. The module has 8 input channels which are individually configurable for range and alarm limits. Four controllable outputs can be used for sensor excitation or as 5V logic compatible outputs. Other MAQ20 analog input modules are voltage, current, and thermocouple modules and RTD and potentiometer modules. The system also includes analog output voltage and current modules and discrete input/output modules, in addition to the communications modules. Details on the system can be found in the 2016 MAQ20 Product Catalog, available at http://www.dataforth.com/catalog/pdf/MAQ20_Catalog.pdf. An overview 4-page brochure is available at http://www.dataforth.com/catalog/pdf/MAQ20_brochure.pdf. MAQ20 modules mount on industry standard 35x7.5mm gull-wing DIN rails. 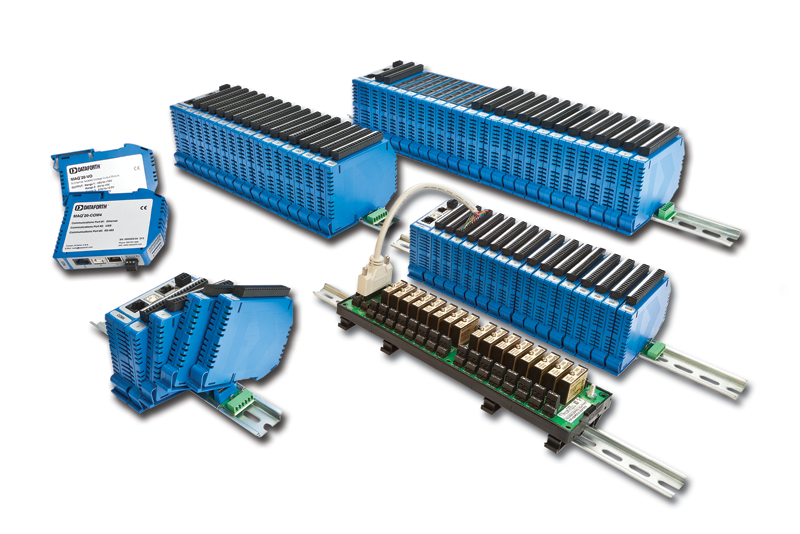 A backbone within the rail provides power and communication intercon¬nections between the communications modules and each I/O module. Input power is from 7 to 34VDC; overload and reverse protection are provided on the power input terminals. Product integrity is ensured by a 48-hour factory burn-in at 85°C. Dataforth was established in 1984 and is the world leader in data acquisition and control, signal conditioning, and data communication products for industrial applications. Worldwide, our products provide rugged signal and data integrity and wide spectrum accuracy. All Dataforth products are manufactured in the USA and have been RoHS Compliant since 2006. The Dataforth Quality Management System is ISO9001:2015 registered. For additional information, call 800-444-7644 toll-free or email sales@dataforth.com.